Vienna (German: Wien) is both a state of Austria and its capital city. 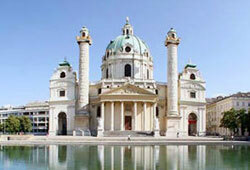 Vienna is a city of considerable charm and old-world splendor. It is one of the most romantic cities of Europe, comparable to Paris. As the "City of Music," Vienna has nurtured many famous composers of classical music and opera, including Beethoven, Mozart, Haydn, Schubert, and the Strausses. Many of them are now buried in one of Vienna's grand cemeteries. Once the capital of the former Austro-Hungarian Empire, Vienna is packed with cultural and historical attractions, including grandiose palaces, Baroque churches, Jugendstil villas, fascinating old cemeteries, splendid art museums, theatres for opera and the performing arts, and traditional Heurigen wine taverns. But it is also a modern city, with an extensive and efficient public transport system using buses, trams, and the U-Bahn (subway). Another way to get around is by cycling; Vienna is a very bike-friendly city, being fairly compact and riddled with bicycle paths. Vienna is also highly cosmopolitan, with glamorous shopping avenues like Mariahilferstrasse and Kärntner Strasse, and a vibrant nightlife that is mainly concentrated in the Innere Stadt, the canal area in Leopoldstadt, and the Copa Cagrana in Donaustadt. Expatriates who choose to live in Vienna usually stay in the 1st, 4th, 6th, 7th & 9th, 18th, and 19th districts, or the mid-price residential areas of the 3rd and 23rd districts. The 1st is a prime district, but the 18th and 19th districts are favoured because they are close to the international school and the atomic agency, where many expats work, These two districts, being suburbs, offer houses rather than apartments, the 18th being a particular favourite for families. Otherwise most residences in Vienna are apartments, as there are few houses available in central Vienna. It is easier to find a house (or a villa) in one of the city's outlying suburbs. Vienna is noted for offering a very high quality of life. The Mercer Human Resource Consulting ranked Vienna 2nd in Europe on its 2008 Quality of Living Survey. Vienna is also considered one of the world's safest cities, with a low crime rate and an efficient public transportation network that makes it safe and convenient to go around at night. Mercer ranked it the world's 6th safest city (out of 215 cities) on its 2008 survey. As for cost of living, Vienna is expensive compared to most of Austria. In the Mercer Cost of Living Survey 2008, Vienna ranked 19th out of the world's 50 most expensive cities (in comparison, New York City ranked 22nd). But it is definitely less expensive than London, Paris, or the cities of Geneva and Zurich, in neighboring Switzerland. Vienna is a city rich in parks and nature areas, making it one of the greenest cities in the world. As Austria's centre of education, Vienna has many notable universities, professional colleges, and international schools.